Really? 'cause ya know John Key is such a nice man and if our Richie likes him then he must be good. I'm sorry to rag on those who vote National, I'm certain there are those who genuinely believe that making the rich richer is ultimately better for the country. There are those for whom the ideology makes so much sense that they cannot believe the bad things that happen are related to National's actions. But there is a portion of the voters who look at the rich getting richer and think "that'll be me soon", there is a portion who think that $10 a week will make all the difference. And they are simply too stupid to realise that to pay for that $10 a week the social welfare system, the education system, the health system are being systemically gutted and sold off for scrap. There are a few genuine believers, there are a few genuinely good National MPs, but they support a group of corrupt, venal scum who only care about the power they get to wield and if a few more people from Christchurch commit suicide to support that power then they are comfortable with that. Press editorial doesn't mince words. Roughan being an arse again, I'm guessing? Meanwhile, the Herald's radio arm has interviewed a CDHB board member and the Minister (who frankly does not seem to know what his ministry have been up to). What struck me most about the editorial and the whole efficiency argument is that it make the presumption that health workers would naturally skive off and waste money if they could. It's the idea that given the chance they would take their salary and just go home and watch cricket instead of doing their job. The thing is, most health workers really wouldn't walk away and let someone suffer in pain or bleed over the pavement, they CARE about the work they do. What is abundantly clear is that the folks in parliament and the plonker who wrote the editorial can't conceive of anyone doing their job without having a big stick waved over them. Which leads me to the conclusion that far from targeting health workers we should be targeting Herald opinion writers and politicians because they clearly would skive off home to watch cricket. The Herald editorial is here if anyone wants to read it. And it's a truly pissweak effort at editorial-writing. The point, economists will say, is to put public hospitals under the sort of financial discipline that works in the private sector. The so-called "required savings" should really be called a return on operating capital. In theory, managers of a public service should not need that obligation in order to ensure their operations are not wasting money. But in real life, human nature does need this sort of demand. We tend not to worry about waste and inefficiencies unless we have to find savings. Could we get a citation up in here? If "economists will say" that, could we perhaps name one who does say that? And if we're declaring what happens "in real life", might it be an idea to note a real-life example? It really is the most awful example of faux reasoning. It tries to invoke evidence without the bother of actually canvassing any evidence. Labour's health spokeswoman, Annette King, says boards are taking the easiest option by not filling vacancies. She is probably right. It is easier to make do with fewer people than to negotiate more efficient rosters to make maximum use of equipment or maintain a culture in which all professional staff are accountable for the resources they use. But these are the sort of disciplines that perhaps can extract better value for the taxpayers' outlay. It has to come from the top where the demand will never be popular. It all seems so easy when you put it that way, doesn't it? The author might have, you know, done some work on how DHBs actually do manage resources. He might have told us something. Instead it looks like nothing so much as someone carrying water for Jonathan Coleman. can extract better value for the taxpayers' outlay. It has to come from the top where the demand will never be popular. I wholeheartedly agree with that. We should start at the top, by demanding that the prime minister produce 10% more prime ministering on 10% less money, every year. And ditto for all the other skivers and slackers in parliament. I'm sure that if we cut the parliamentary services budget 10% nothing bad would happen. We could also sell off that extremely valuable site in central Wellington and promote regionalisation at the same time by relocating it to some much cheaper offices in somewhere like Taumatawhakatangihangakoauauotamateaturipukakapikimaungahoronukupokaiwhenuakitanatahu. Couldn't agree more. I worked in the public system for about 12 years and the only waste I saw was the endless restructures, and name changes, forced on us by central government. Fundamentally this government seems to consider all public servants as lazy and docile, and that crunching everyone to do more for less won't effect outcomes. Fact is everyone I know who works in health, education and welfare is already doing a lot with next to nothing. (And in some cases nothing). I wholeheartedly agree with that. We should start at the top, by demanding that the prime minister produce 10% more prime ministering on 10% less money, every year. I believe you've got to the nub of it, Moz. I'd be happy for a cost neutral solution that involved 100% less prime ministering, tbh. for love of fellow humans. It really is the most awful example of faux reasoning. CDHB member and former Ecan councillor Jo Kane yesterday broke the board members' silence on the machete being taken to mental health - and the rest of the health sector - and what it means for the Canterbury health system. Rearranging the deckchairs...Are we on a sinking ship? We need to talk about Cbristchurch. If you’d asked me a fortnight ago what the mood of Christchurch folk was, asked for a precis of our psychological landscape I would have said that we were doing okay. That we were finally moving on from our quake traumas, at least those of us not in the seemingly unending embrace of an unresolved claim (EQC will tell you that most are now resolved and it’s only the most complicated claims that remain open but everyone knows someone who is in this situation). These people excepted though, my sense was that we were doing pretty well. And I would have been dead wrong. Read the rest, Moata lays it out so well. 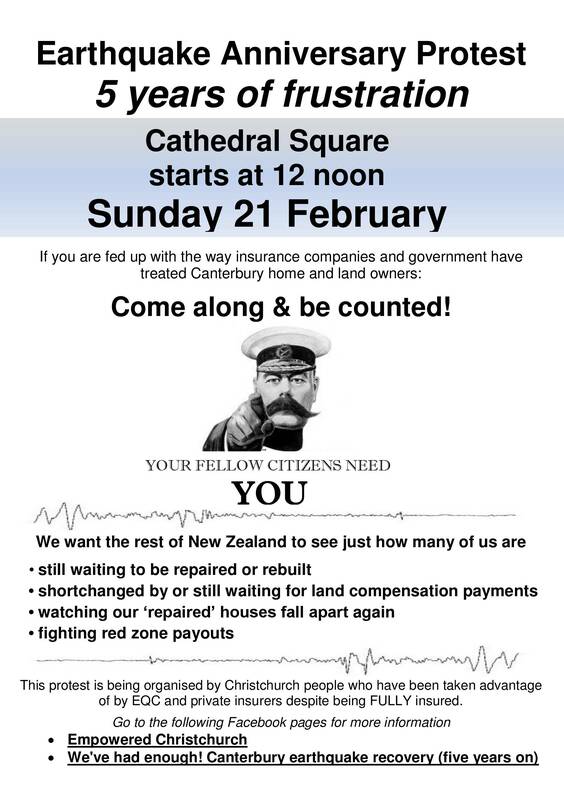 Give Chchch a fair shake!